The new digital publication about how libraries change lives in the European Union is fascinating. Members of parliament and library users tell their stories about the power of libraries – and there is video footage of amazing libraries all over Europe. The publication focuses on 3 policy areas: Digital inclusion, Lifelong learning and social inclusion. 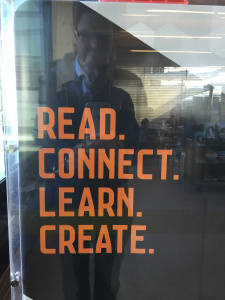 This is not the whole picture – but in just these 3 areas Europe’s more than 65000 public libraries change lives every day. A surprisingly high number of 18 % of citizens in the EU have never used the internet. Libraries provide free access to the internet for 13,9 million citizens every year and skilled librarians offer guidance that empower people to be digital citizens and understand privacy issues. Libraries actively support lifelong learning and offer people access to cutting edge technology and digital skills. Thereby they enable people to participate in the knowledge economy. 24 million adults take part in non-formal learning activities at their public library every year making libraries absolutely essential strategic learning institutions that make their communities smarter.